Whimsical artist, social media influencer, lover of locally sourced tees and good jeans. His art-making and street clothes have blended together over time, giving him paint-splattered boots and a one-of-a-kind graphic tee collection. 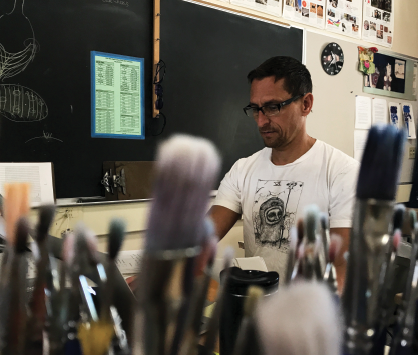 To begin, Mr. Ferrera is an art legend. He runs the ceramics and glass blowing studios, and his personal art style is nostalgic, whimsical, and has racked up 34 thousand followers on his art Instagram account. See our newest issue in .pdf form!